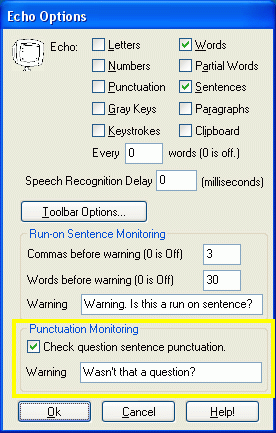 Punctuation Monitoring is new in Aurora Suite. Whenever you start a sentence with a word that indicates it is a question, such as "who", "what" or "where", Aurora will check that you end the sentence with a question mark. If you don't, it will speak aloud to let you know that you should check what you've done.